Birthday parties are one of the most looked forward to events for my kids each year. I will be one of the first to admit that I went extremely overboard with my first kid’s parties. 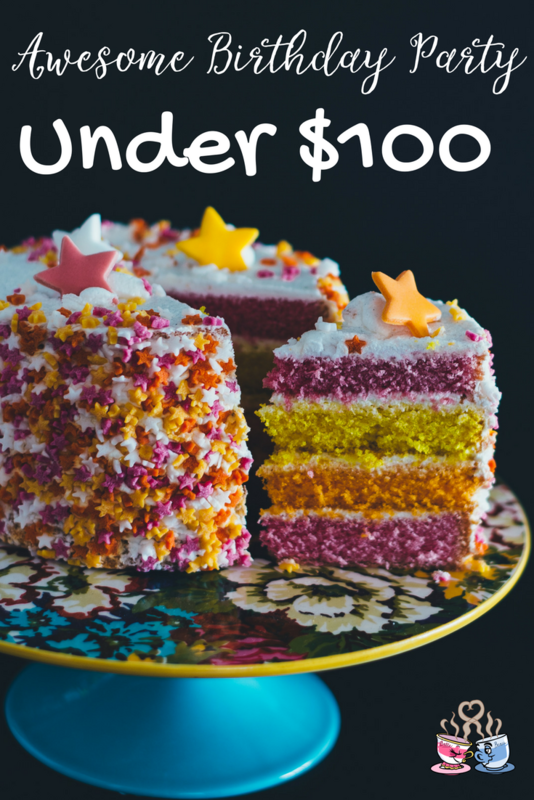 That is why I wanted to share these tips for How to Throw an Awesome Birthday Party for $100 or Less. They were easily costing me $300 or more. These days that seems to be the norm for birthday parties but, I took a step back to evaluate things and realized that is not necessary. My favorite memories from growing up are of my friends and I playing games in the backyard. This post contains affiliate links to Amazon. I may earn a small commission on purchases made via these links. Every year my kids choose a theme for their parties. Everything revolves around the theme, including favors. This makes decorating much easier for me. Our parties are typically fairly large. We have a total of about 65-70 people and average about 25 kids. At each party, we serve a meal of some sort as well. So, this shows you I am not talking about a small gathering or just immediate family. For most of our decorations, I go to the Dollar Tree. This is different than most dollar stores because everything in the store is $1. Here I make sure to get the plates, bowls, streamers, table clothes, balloons, cellophane favor bags and a few of the favors. We also pick up stickers here too! If your party is smaller you can even pick up matching plastic silverware here but, since our parties are larger that doesn’t work for us. 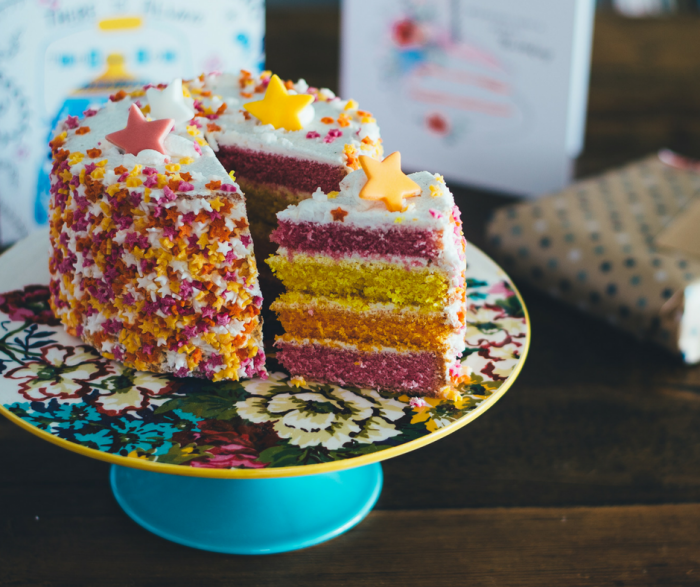 If you look, you may also find a lot of great birthday supplies on Amazon for lower costs when purchased in bulk quantities. Definitely, do some comparison shopping. You’ll find you may be able to grab things like kids party favors or large packages of balloons a bit cheaper. Our next stop is a big box store. Our store of choice is Costco but, I am sure all of them have great deals on your needed supplies. This stop is mainly for food. Here we pick up our bulk meats, assorted chips, and buns. This stop usually costs no more than $50 and we have more than enough food for everyone. Since we host parties every year, I also pick up one of their assorted silverware boxes and cups as needed. These typically last about 5-6 parties so, we just store them in between. This is cheaper to buy in bulk and use for a few events than buying the smaller packages at the dollar stores. Dollar General is our next stop. Here we buy drink mixes (single packet ones), condiments and little kid cups. The little kid cups are smaller and come with a lid and straws. These are easier for my two year old’s party as it leads to less spilled drinks to clean up. Sometimes, if they have it, I will pick up one or two things that go with our theme for decorating as well. That sometimes consists of balloons if I didn’t find them at the first stop. Walmart is our last stop. This stop is meant for a few extra things for their party favors if we didn’t find at the dollar stores. Ice Cream and things like lettuce and tomato for sandwiches or burgers if that is our food options are also purchased here. I will buy a couple more themed decorations if needed. This is sometimes the only place I can find the specifically themed decorations but, I make sure to check the other places first. When it comes to decorating simple is best. There is no need to go overboard with decorations. Tablecloths, streamers and some balloons and you are good to go. Our tablecloths, bowls, plates, and streamers are all plain colors that compliment the theme. This saves several dollars alone. I tend to spend a little extra on themed balloons but, I only get 1 or 2 packs and supplement with other assorted balloons. If you want your balloons to float you will need a helium tank as well. Those typically cost about $25 depending on where you get it from so, we bypass this by hanging balloons from the ceiling instead. Sometimes we also tape them to the gift table too. 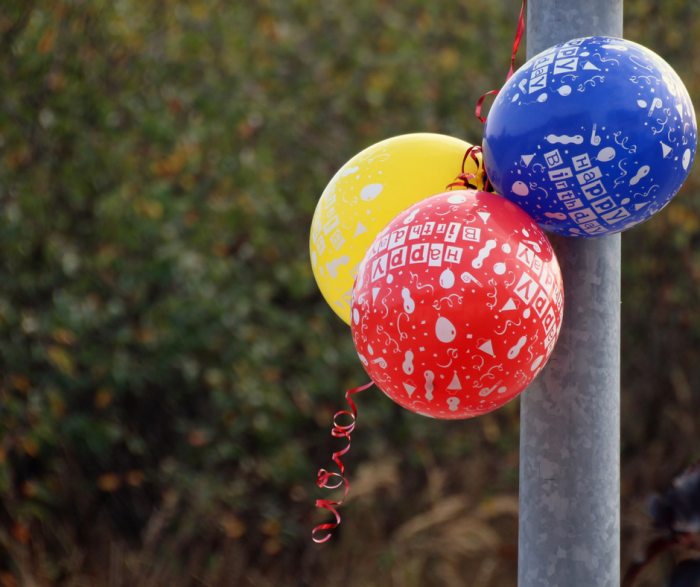 Note: If you plan to host parties a lot, you may want to budget and invest in a reusable helium tank that you can take advantage of on a regular basis. Another option is to get just 2-3 specific themed balloons with helium at your local Dollar Tree for just $1 each. To spruce up the tables we get stickers that match the theme and decorate the table clothes with those. Doing this the price is still less than a theme specific tablecloth. We also add streamers to the tables. We aren’t picky on cup color so, sometimes these match the theme and sometimes they don’t. I tend to pick up whatever is the cheapest at Costco as need. If the color of the cups doesn’t exactly match the selected theme, we will add stickers to these too. When it comes to drinks we offer a large container of ice water. From here kids and adults can add their selected mix-in’s for flavor if they choose to. This keeps costs low and seems to work well to offer a large variety without worrying about allergies or needing to buy diet drinks. When serving Cake and Ice Cream I find it easiest to serve cupcakes and individual ice creams. These both allow for quick serving when you have antsy kids in line and, as a bonus lead to less mess for me. You can make your own cupcakes and add sprinkles in the color of the theme, or you can save to buy through the grocery bakery. Individual cups of ice cream are usually fairly inexpensive at Walmart or Costco. Our parties typically take place at one of their grandparent’s houses as it is closer for most of their friends but, on several occasions, we have rented a park shelter for super cheap as well. Even if your child has a winter party, look for an enclosed shelter (just be sure to tell your guests it is still indoors). If a park shelter doesn’t work, there are several other locations that are budget friendly. Don’t be afraid to call around and ask about renting space! Places like churches, local play centers, parks, kids museums, movie theaters, bowling alleys, and more may be surprisingly inexpensive or even free. When it comes to activities this can seem daunting but, it doesn’t need to. Simple yard games that you played as a kid will keep the children (and possibly adults) entertained for hours. Our most recent birthday party consisted of freeze tag, red light/green light, and everyone is it. The kids ran and played for 3 hours and not a dime was spent on activities. When planning for party favors, we avoid any trinkets. Our favors usually consist of things like bubbles, playdough, stickers, mini coloring books. Things like this keep the kids busy for a bit after the party while they unwind. If you have access and time to plan ahead, Oriental Trading offers great deals on bulk quantities of these items. Alternately, you may want to check Amazon for good prices on bulk stickers, activity books, or similar. This 24pk of Crayon Bubbles is a great deal on Amazon and is a cute idea! For every party that, we host I always plan on having extra people. If people didn’t RSVP to the party, I plan for them to be there. This way, if they show up, I am not scrambling to make sure that I have enough food or party favors. We always make 2 -5 extra favor bags to have on hand as well. While this seems like a lot, it has come in handy when kids I didn’t expect to show up came. I didn’t have to apologize or try to scrape up another bag for them at the last minute. Plus, as a bonus, there will most likely be leftovers for your kids to play with later. Another extremely helpful tip is: ask your kids for their input for their birthday parties but, don’t take them to the store with you. Taking the kids to the store will lead to you spending more on things that are not necessary. After every party, we tend to have decorations and other things left over. Due to this, I have what we have deemed the “party tub”. In this tub, I pack everything from silverware and cups to unused stickers, tablecloths, balloons, and streamers. This way I can go through it the following year and use what I already have. This helps save costs on your future parties. Keep things simple. There is no reason to go overboard with decorations or activities. At first, I really thought kids were going to be bored but, I was told otherwise. I had parents messaging me months later saying their kids were still talking about the party. I also had kids show up to the party the following year, still talking about the previous year’s party when I had felt like the party was going to be very boring for them. More often than not, I am being told that our parties are something all the kids are looking forward to. 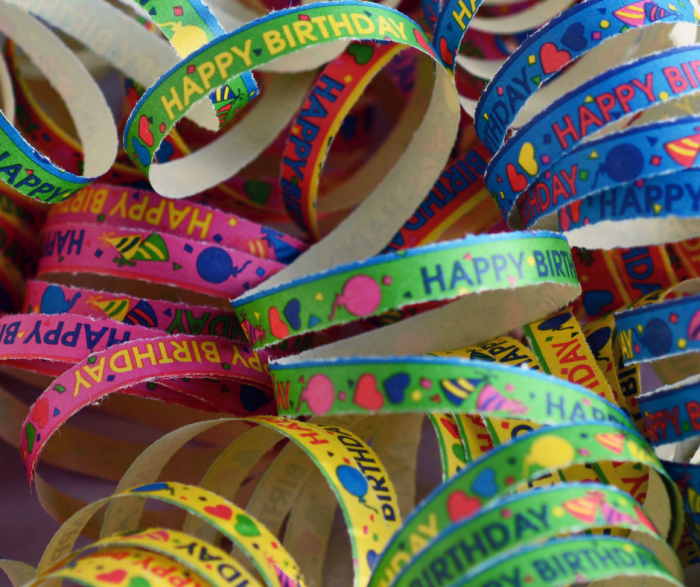 Fight your instincts and go simply to create a great awesome kids birthday party on a budget!